Norfolk in autumn takes on a completely different feel to that of the summer months - the crowds have dispersed and everything becomes more peaceful and the pace of life seems to slow right down. The days are drawing in and the weather is definitely getting colder, the coats are coming out of the cupboard and the wellies are being used more and more! That is Autumn for you! However, as you’re well aware, with Autumn comes beauty and no more so than in Norfolk. And in amongst all that, if you have children, half term happens! Many of these ideas are similar to the Summer and Spring ideas, but you see them from completely different perspectives as the seasons change. 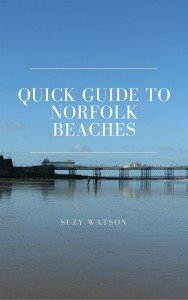 Norfolk in Autumn is classified from September to November, and is packed with things to do, so let me give you a few ideas here. There’s no better time to walk than in the Autumn, especially as the temperature hasn’t got too cold quite yet. 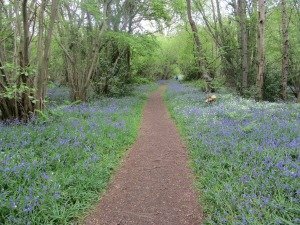 There are so many wonderful walks in Norfolk, and you can pick and choose from some ideas I have hear. 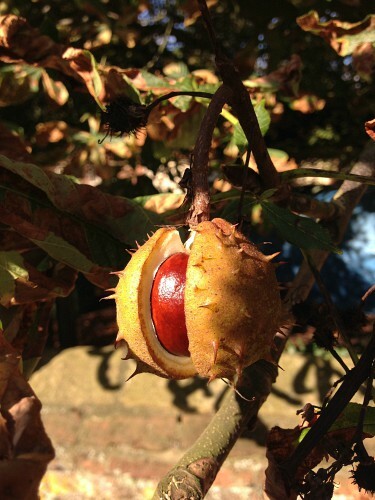 Norfolk has so many ancient woods and parks for you to enjoy, and with the changing autumn colours, conkers to pick, acorns and chestnuts to scrunch on and sunlight filtering through the trees on a sunny day, what could be nicer than a good walk? 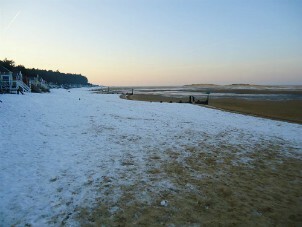 Coats, hats and wellies to the ready, a breath of Norfolk fresh air is just what’s needed to blow the cobwebs away! Sheringham Park is open parkland as well as woodland, and again has colour coded walks. Thetford Forest is massive! Lots of walks here too at High Lodge where you can even take the bikes. The Norfolk Coast Path is another great walk at this time of year. You don’t have to walk it all (! ), you can do stretches of it by taking the Coasthopper Bus and getting off where you want, and then walking back to wherever you left your car. Why not park your car near a pub, catch the bus and walk back for a pub lunch with local food sitting by a roaring fire! The Lifeboat, The Chequers, Briarfields Hotel, The Lodge Inn and The Lobster Inn are all excellent places to have lunch along the coast, with welcoming fires and good food! Norfolk Trails also puts on a walking and cycling festival during the month of October. There are walks and rides for all abilities including some interesting talks such as visiting Seahenge at low tide and finding out how birds are ringed at Holme Bird Observatory (this walk was put on by the AONB Partnership), walking along stretches of the Marriotts Way, Wherryman's Way or even discover Norwich, King's Lynn or areas in the Broads. You can see all their events here. 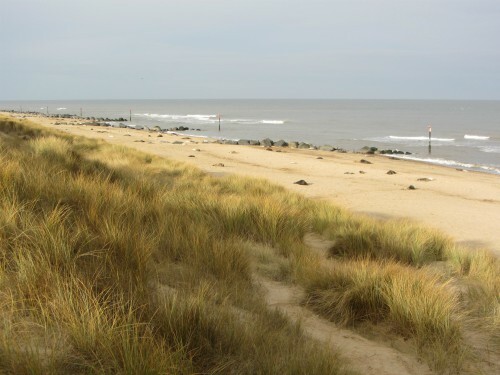 Norfolk in autumn has the most amazing wildlife, but a real draw to this county is the seals and their pups. The seals don’t really start pupping until the winter months (November to February), however, they do start to come onto the beaches before that (the blobs in the photo above are seals on the beach!). 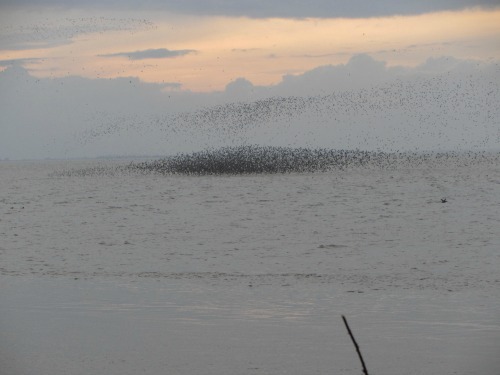 There are two places in Norfolk where you can see these incredible creatures. One is on the North Norfolk Coast at Blakeney Point, the other is at Horsey. 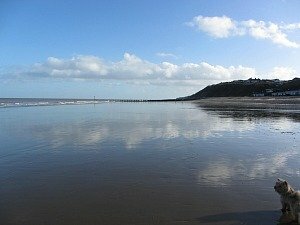 During September and October, you are free to walk on the beach at Horsey, but from November onwards there are restrictions, and a viewing area is put in place. You can read more about the seals here. 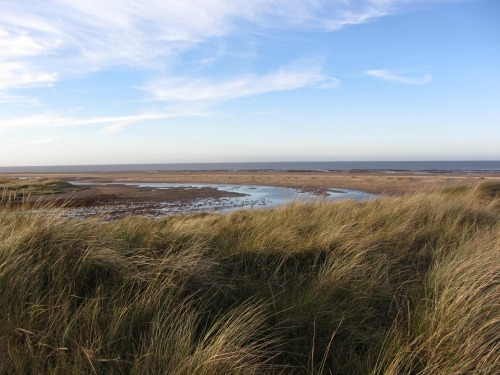 This is the time to really discover quiet how beautiful the Norfolk coastline is. The summer crowds have dispersed leaving the beaches empty. 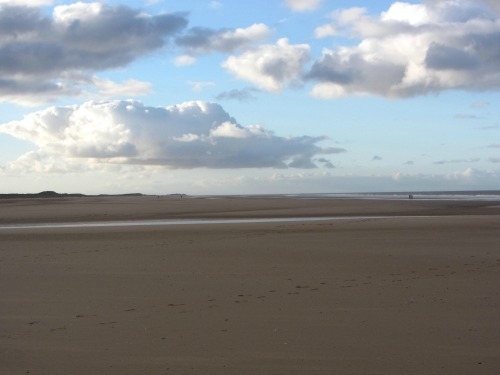 Norfolk in autumn is one of the most blissful times to walk on these fantastic beaches. The car parks aren’t so full either! 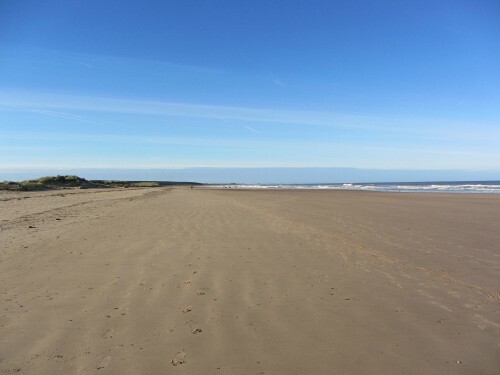 Pick and choose which beach you like the look of on our Norfolk beaches page here. Norfolk is one of the best birdwatching areas in the UK, and no more so than in the autumn and winter months. 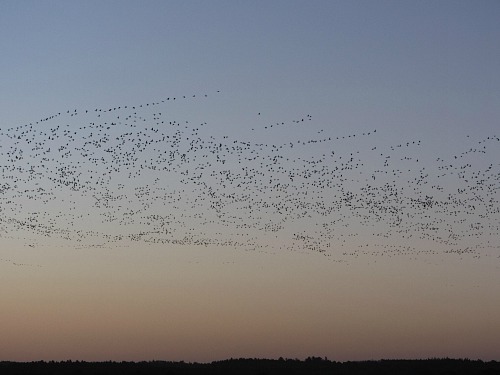 In autumn, the migrating birds flock to Norfolk, as it's their first port of call on their way south. Some don't even go any further. The tens of thousands of Pink Footed Geese begin to appear, having bred in Iceland they return here for the autumn, and the knot wader spectaculars at Snettisham are well worth a visit. Even if wildlife isn’t your thing, these are sights that you should see! 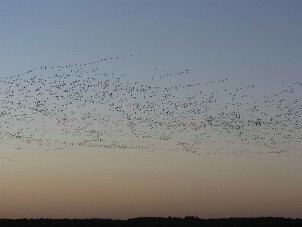 Watching these wintering birds flying in their 'V' formation over the Norfolk skies has to be one of the best sights and sounds in Norfolk during these autumn and winter months. You can read more about the Pink Footed Geese and the Wader Spectaculars here. This is now such a popular time of year, you’ll always find somewhere to celebrate it. In Norfolk, it’s usually the National Trust properties that put on fun events for all the family to enjoy. Pensthorpe Waterfowl Park also put on events over the half term and Halloween. You can read more about Pensthorpe and see their events at the bottom of that page. This is a really fun few hours walking llamas. It's a fantastic experience and something very different. It's not suitable for children under 8, but for anyone over that age, from 8 to however old you may be, this is definitely worth trying. 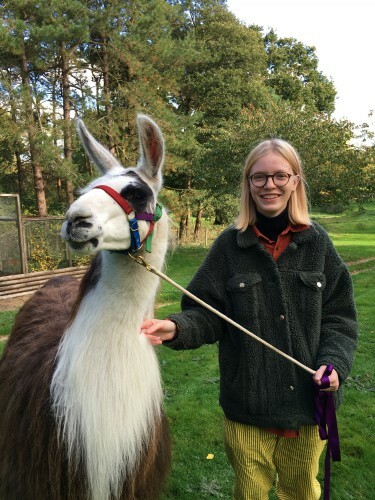 You can read all about my llama experience with Norfolk Lllamas here. Not every day in Norfolk is good for being outside! Here in Norfolk we have the excellent Sainsbury Centre for Visual Arts, just outside Norwich. Usually there is an exhibition on at this time of year so it’s worth checking their website for the latest news. A perfect way to spend a few hours. 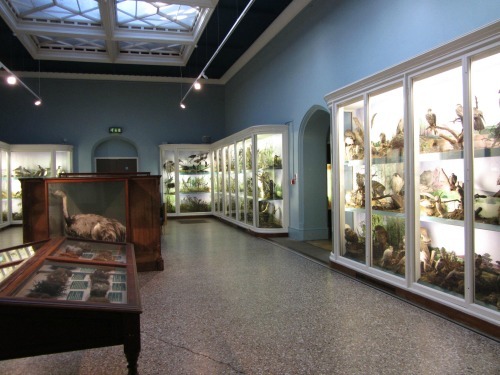 Norfolk also has many museums, why not take a look at my pages on some of the museums here. You could visit Norwich Cathedral and Norwich Castle Museum all in one day, along with a nice lunch and wander around the historic city. 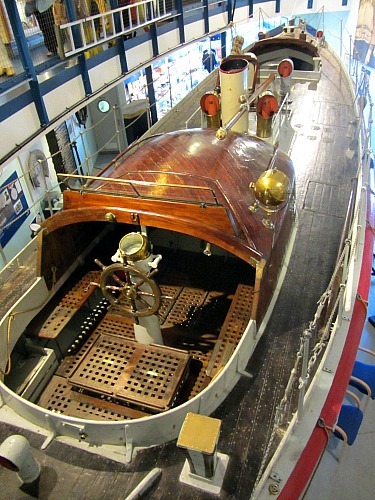 If you happen to be on the coast, why not visit Cromer Museum and the RNLI Henry Blogg Museum, and Lynn Museum has the story of the discovery of Seahenge. As mentioned in Summer in Norfolk, this is yet another idea for being inside (as well as outside if you feel like wandering around the magnificent grounds of some of these houses). Most of these houses are beginning to think about either closing down for the winter, or scaling back on the days that they are open, so now is a great time to head along to these incredibly historic and beautiful houses while there aren’t so many people around. 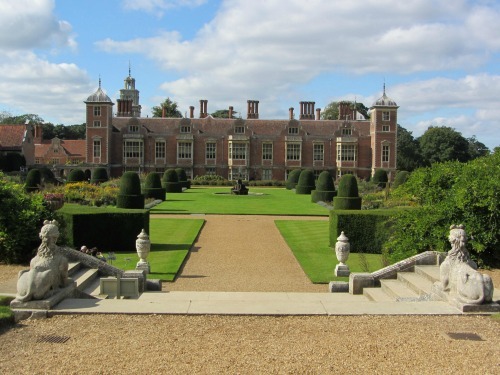 Here you can choose which Norfolk stately home you'd like to visit. I hope that’s given you some ideas of what to do in Norfolk in Autumn and I really hope you enjoy yourselves!